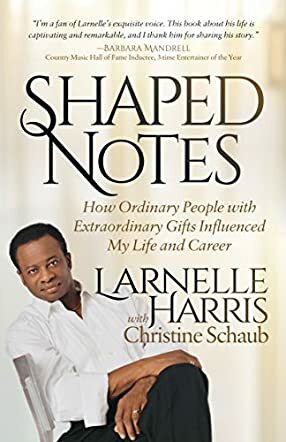 Shaped Notes: How Ordinary People with Extraordinary Gifts Influenced My Life and Career is a nonfiction inspirational memoir written by Larnelle Harris with Christine Schaub. Harris has won five Grammy Awards, eleven Dove Awards and a Stellar Award during a singing career that has spanned over forty years. In his preface, Harris notes how he may have been looked at “as just another poor black kid from the back roads of Kentucky,” except for the magic that happened when he opened his mouth, and he began to sing. Harris was blessed with a clear and strong soprano voice, and Miss Georgia Donehy, the local church organist and piano teacher, soon realized what a gift he had. She became the first of the mentors who helped Harris make the best of his gifts and helped him learn how to use them in a life devoted to spreading the word of God. Harris had other mentors during those early years: Miss Dale, his second-grade teacher who also led the choir, Miss Fisher, the wise and dedicated librarian, but particularly Mr. Summers, the principal whose paddle was feared by all, but who surprisingly called the shy kid who was constantly teased about his soprano voice, into his office and showed him in a most eloquent way just how wonderful a gift it actually was. Shaped Notes is a moving and well-written account of a life dedicated to the service of his Lord. I particularly enjoyed Harris’s accounts of his early life and his interactions with those teachers and other mentors who made such a difference. I especially appreciated learning about Miss Fisher and Mr. Bate, and the genesis of the Bate School, and how Harris expanded his musical gifts to the saxophone and drums as well. I felt excited for him as he went to Band Camp and found the impetus to learn to sight read and become the talented drummer he had the potential to be. The full scholarship he was offered by Western Kentucky University seemed the culmination of all the effort he and his various mentors had put in; however, his progress continues on to this day. Shaped Notes is a marvelous story, one that kept me engaged and inspired throughout, and the pictures that are included in the book are a real plus for making Larnelle Harris’s story come to life. I also took the time to pull up some YouTube performances so I could hear his extraordinary vocal skills for myself. Shaped Notes: How Ordinary People with Extraordinary Gifts Influenced My Life and Career is most highly recommended.